From Pemberley to Milton is the final stop of the blog tour for Caitlin Williams’s latest book, When We Are Married. I am very, very honoured to be a part of this blog tour because Caitlin Williams has clearly become one of my favourite authors, so I would like to give a special thank you to Claudine Pepe for inviting me to participate in this tour. Do you know when you’ve read several stories from an author and you know exactly what to expect? Let me start by saying that’s not what you’ll feel when you read a book penned by Caitlin Williams! I read Ardently when it got released and it became immediately one of my favourite books. When The Coming of Age of Elizabeth Bennet came out, I was eager to read it, expecting something similar to her debut novel, but the book couldn’t have been more different. When her story opened The Darcy Monologues anthology, the writing style amazed me, it was different from what she had written before, it was intense, powerful and I loved it! And finally this month, When We Are Married came into my hands, and I was once more caught by surprise with Caitlin Williams’s writing! Mark my words, this author will amaze you at every turn! It is incredible how easily she goes from one writing style into another never-failing to capture us to the fullest with each story! When We Are Married is starts as a light, funny story that couldn’t have been more different from The Coming of Age of Elizabeth Bennet, and will make you laugh out loud with Elizabeth’s thoughts and Maria’s comments throughout the book. I don’t remember laughing so much as I did when, on the home from Darcy’s house, Maria says “the food was very nice” (you’ll find it funny too when you read it in context). 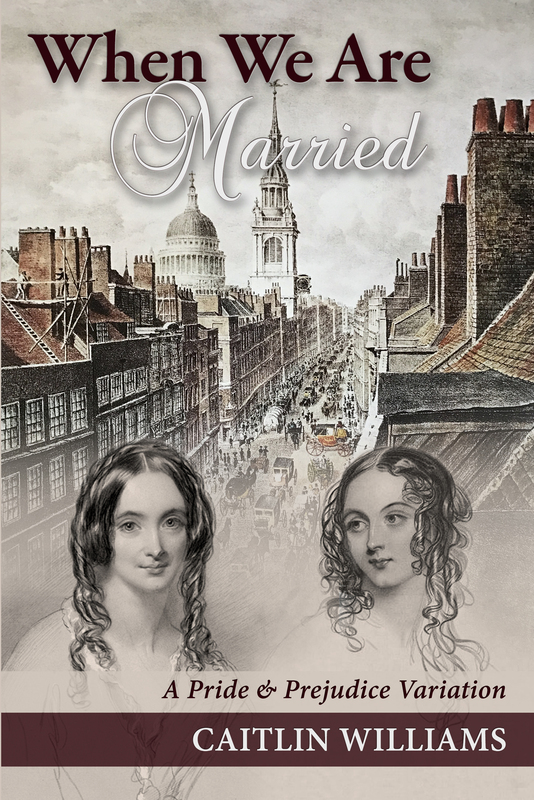 But the book is not merely humorous, it is so much more than that, it is an incredible romance full of electrifying moments between Darcy and Elizabeth. The relationship they develop from the first pages is beautiful, but they will not find it easy to be together. They will have to overcome some obstacles, and the angsty path they take to HEA will only make their reunion even more intense and passionate! 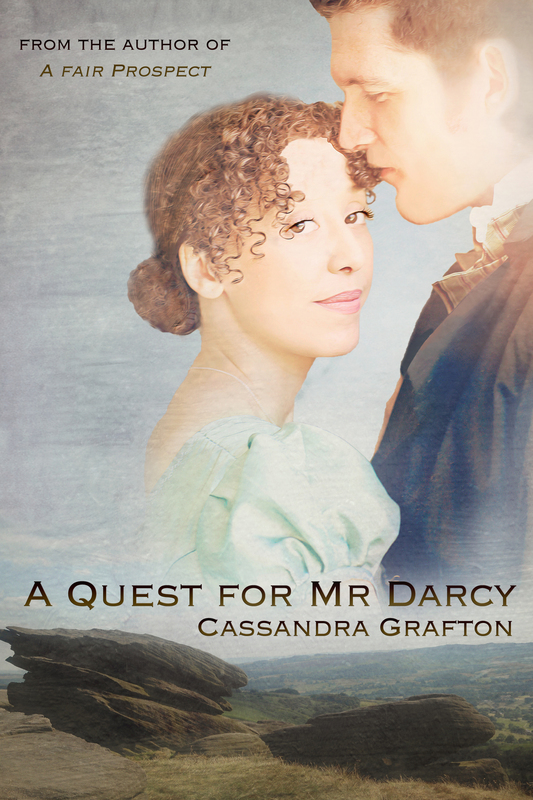 In fact, passionate is a good word to describe Darcy in this book. He is romantic, charismatic, charming, funny, interesting, caring… I could go on, and on…This Darcy was unforgettable. He definitely knows how to make a lady feel loved by him, and will not give up on his love easily. The strength of character he shows by pursuing Elizabeth made me love him at every page. Who can resist a Darcy who will go anywhere for Elizabeth? When We Are Married is one of those books you will not be able to put down once you start reading. It will make you laugh and cry, it will make you dream and comfort you. It was the book that gave me more pleasure to read this year, and I can see myself re-reading it in the near future. If you haven’t read it yet, you must. In it you will find characters with interesting and unexpected evolutions, the complexity of sisterly relationships, misunderstandings that make it a page turner and an unforgettable romance 🙂 I rate it at 5 because I can not give it a higher rating, this book can not be missed. Caitlin Williams is the author of two novels, Ardently and the best-selling The Coming of Age of Elizabeth Bennet, both based on the characters from Pride and Prejudice. She’s a lifelong Austen devotee and lover of all things regency. Originally from South London, Caitlin spent thirteen years as a detective in the Metropolitan Police, but is currently on a break from Scotland Yard so she can spend more time at home with her two children and write. Caitlin William would like to give away 1 copy of When We Are Married to one of my readers. If you’ve read my last post, you know I was very lucky to meet Cassandra Grafton in Winchester last week. Ever since reading A Fair Prospect, I wanted to meet Cassandra and place her a few questions. Now, with all the celebrations occuring in Winchester, and with the release of A Quest for Mr. Darcy, I got a chance to finally meet and interview her. I hope you enjoy this interview where she goes from her love for Jane Austen, how she discovered fan fiction and what we can expect from her latest book, A Quest for Mr. Darcy. Thank you Cassandra! It was lovely meeting you too! We’ve discussed many things already, but I have yet asked, how did Jane Austen influence your life? Oh gosh, where do I begin? I first discovered Jane Austen and her works when I was 15 (that’s rather a long time ago! ), and even now, every time I re-read one of her books, I take something new from it. She speaks such wisdom through her characters (not all of them, of course! ), and I never cease to be amazed at how relevant her stories are today and how her words resonate here in the 21st century. It has to be said, however, that the biggest influence is far more personal. By nature, I am an introvert, and I’m a pretty solitary person when it comes to writing, but Jane Austen has persuaded me out of my comfort zone to attend events and meet-ups where I have been able to connect with some lovely people – many of whom I’ve encountered online – and who have since become hugely significant to me. My life has been enriched beyond measure as a result, and I only wish I could thank Miss Austen in person! And what inspired you to go from reading Jane Austen to writing JAFF? I’d discovered the world of fan fiction in the early 2000s when I’d ventured into the online Harry Potter community during the three long years between books 4 and 5. I started to co-write Harry Potter fan fiction with Ada, a new friend I made online, and it was such fun! Becoming curious about similar online communities, I began to look around for those connected to my favourite author and found several sites dedicated not just to the lady but also to writing JAFF! After co-writing so many short stories inspired by Harry Potter, I finally decided it was time to try my hand at a full length one inspired by Jane Austen’s characters, and so I began A Fair Prospect. Following A Fair Prospect you wrote a Jane Austen inspired, but non-JAFF book, called The Particular Charm of Miss Jane Austen, but now you are back to JAFF with the recently released Mr. Darcy’s Quest, what can you tell us about it? It follows the premise that Darcy does not go home to Derbyshire in the August following his rejection by Elizabeth but instead he goes abroad, taking his sister with him. Not around to ‘save the day’ when Lydia elopes with Wickham, the story begins as we discover the aftermath of that and its impact upon those affected. Darcy is returning to England a year later, convinced he is over his foolish infatuation with Elizabeth and determined to do his duty, both to the estate of which he is guardian and to his sister: he intends to secure a wife and without delay. Soon restored to his home in Derbyshire, he puts his quest in motion, preparing to welcome guests from Town, one of whom is a suitably eligible young lady he has earmarked as his future wife. But it seems there are new tenants on the estate – tenants named Bennet. Could it be coincidence, or is his path fated to cross with Elizabeth’s once more? With the addition of his friend, Bingley’s, mischievous twin younger sisters, mysterious letters from a stranger and a shadowy figure lurking in the grounds of Pemberley, Darcy’s carefully laid plans are soon in tatters as the rigid protection he has placed around his heart begins to falter. The mysterious letters and the shadowy figure bring some mystery to the book. Is this a genre you would like to develop? Very much so! I didn’t realise how much I enjoyed the mystery genre until I co-wrote The Particular Charm of Miss Jane Austen with Ada Bright. It was so much fun. In fact, the mystery was the main element to that story, with the romance very subtle and underlying (though the sequel will expand on that). With Quest, I loved interweaving the mysterious elements with Darcy and Elizabeth’s growing awareness of each other’s feelings. But the main focus remains romance, right? What can we expect from Darcy and Elizabeth in this book? In this story, although Elizabeth read Darcy’s letter, she has seen nothing of him since the moment he put it into her hands, almost eighteen months ago. She is carrying some resentment towards him for keeping Wickham’s nature secret from the Meryton populace because of the impact upon her family and also is fighting her discomfort over how it is going to feel to meet with him again now she lives nearby. However, she has also realised how she misjudged him, and is daily reminded of his value by those in Derbyshire who hold him in great esteem, so she is in conflict with herself when they become reacquainted. Darcy has convinced himself he is over his feelings for Elizabeth, dismissing them as a foolish infatuation. He believes he has himself under good regulation, but how long will his armour remain intact? I’m not going to say! This story starts later than the majority of variations, why did you choose this approach? My favourite JAFF stories take place after the first proposal has gone so disastrously wrong, so I knew I would continue in that vein. The first idea for the story came from a line in A Fair Prospect. Elizabeth is commenting on the fact poor Darcy seems unable to escape her, their having unexpectedly met again – post proposal – in Kent, London and finally Bath. She remarks jokingly that she will likely return home to Longbourn to find her father planning to move them all to Derbyshire. This idea seemed like it had a lot of potential for fun and, sorry Darcy, also for throwing a few challenges in his direction! How to make it happen, though? Providing a reason for such a thing to take place was key, as it had to have some logic behind it to be credible enough. Darcy not having been around to step in when Lydia eloped seemed the obvious answer, and so I sent him away, hence the story taking place a year later. Readers will find Mr. Bingley’s sisters a little different than usual, what can you tell us about them? The idea of Bingley having five sisters came from Jane Austen herself, or rather from a scene in Pride & Prejudice where Lady Lucas is speculating with Mrs Bennet about the rumours surrounding the number of ladies and gentlemen Mr Bingley will bring to the Meryton assembly. I reasoned that although the early surmising was gossip, the latter comment above is after Bingley has returned from London with his guests, so the likelihood is it could have some truth to it. Just because only two sisters came to the assembly didn’t necessarily mean there weren’t three still at home at Netherfield. It therefore stood to reason they were younger otherwise they would have attended. I decided Bingley’s mother had passed away when he was young and his father had remarried, having three girls, the twins, Olivia and Viola and a younger sister, Julia. It is the twins who feature in the story, and I’m hoping readers will grow to love them! All I can say is, they are nothing like their elder sisters! Mrs Hurst and Miss Bingley do of course feature briefly, but they remain pretty much the same as in the original novel! While reading the book I noticed some interesting names from secondary characters such as Thornton and Latimer. Was this a coincidence, or are you also a North and South fan? Absolutely, Rita! I’m a huge North & South fan! One of the many things I enjoy when writing is naming my characters, and I love it when friends and family say how fun they found it to find themselves or a family member mentioned in some form or another. However, I do also love using names from other works of literature I have enjoyed. I did knowingly, therefore, use some from North & South such as Higgins and Latimer. As for Thornton, Darcy’s valet, he has an entire back-story though it’s not relevant to this story. In brief, he is the grandfather of our lovely John Thornton (big sigh)! The family has always been in service and proud of its history of serving some of the country’s most significant families, but he has become estranged from his only son (John Thornton’s father) who has turned his back on the family tradition to try his hand in trade. Working his way up from a clerical apprentice, he has recently started his own small business in Lancashire. The John Thornton we know and love has yet to be born! Thank you so much, Rita, for asking your great questions. I had a lot of fun answering them! A fan of Jane Austen since her long-distant school days, Cassandra Grafton has been indulging her appetite for all things Austen for many years. Having long wanted to be a writer, she began publishing her endeavours in 2013. A Fair Prospect, a Pride & Prejudice-inspired Regency romance, was released in three volumes. She then went on to be part of the co-writing team on The Darcy Brothers, another Austen-inspired historical novel, before settling down to co-write with one of her best friends. The Particular Charm of Miss Jane Austen, a contemporary mystery/romance, was released in July 2016 under the names of Ada Bright and Cass Grafton. She has two grown up children and splits her time between Switzerland, where she lives with her husband, and England, where she lives with her characters. She is a member of the Romantic Novelists’ Association, the Society of Authors, the Jane Austen Society UK and is a founding member of the Jane Austen Society of Switzerland. The giveaway is open until the 4th of August and to be eligible all you have to do is comment on this post. Share your thoughts with us or place Cassandra your own questions. Today one of the most wonderful weeks that I have ever lived comes to an end. As you know we have celebrated Jane Austen’s live and work throughout this past week due to the 200th anniversary of her death on the 18th of July, and as most events were taking place in England, that’s where I chose to be this last week. I’ve been in England many times and I had visited several places related to Jane Austen, but this was the first big road trip completely dedicated to Jane Austen that I have done. I’ve met lots of amazing people, reconnected with old acquaintances and participated in some ceremonies that inspired me to write a few posts Austen related (bear with me for a while, I’ll be posting more than reviews in the upcoming weeks). My trip started in Milton, er…sorry, Manchester.I would have loved to visit Elizabeth Gaskell’s home there, but as it is only open a few days a week, I didn’t have that chance. I was sad about it, but it means I have another reason to return to the area, so I have to look at the bright side of it. From Manchester I took the train to Stockport to meet for the first time author Lory Lilian, Andreea Catana and Ellen Pickels. These lovely ladies were my travel companions for several days and with them I visited Lyme Park, Chatsworth House and traveled south across the country to attend the religious ceremony in Winchester on the 18th of July. I’ll tell you all about our adventures in the North, but for now, I would like to share with you how it was to be in Winchester on such a memorable date. We got to Winchester on the 17th, but the 18th was the big day! 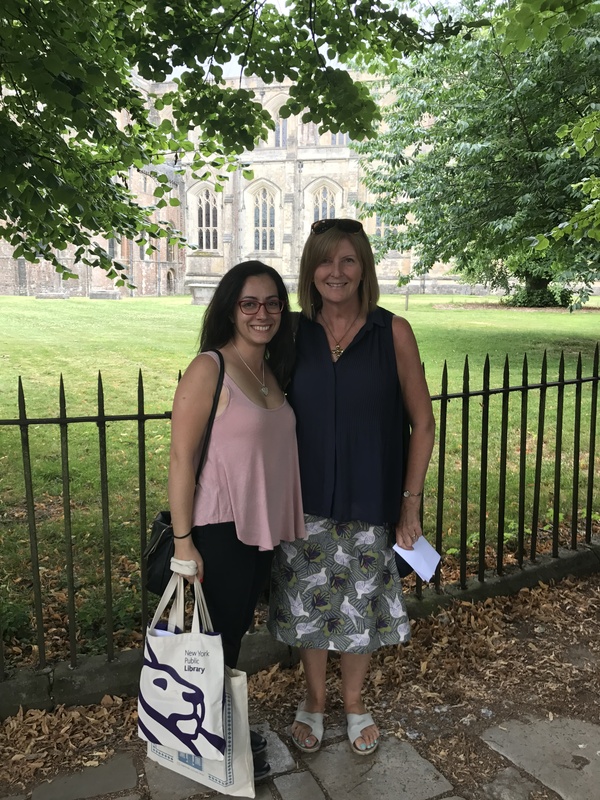 After breakfast we headed straight into the garden in front of Winchester Cathedral, took some pictures and were even interviewed by BBC radio, but the real fun started when our dear friends Joana Starnes and Mira Magdo from Obsessed with Mr. Darcy joined us for the day. With them we attended a recital in the Cathedral, and travelled the streets of Winchester to find the house where Jane Austen spent the last weeks of her life, and where she eventually died on the 18th of July. The house is on 8 College Street but it is now a private house and can not be visited. It bears an oval plaque over the front door, placed there in 1956 and designed and executed by Esmond Burton.It is nowadays the only sign that tells us this is a very special house. In front of it lies a small garden with an Austen quote, and even if some people may miss it, we surely didn’t. Jane Austen wrote to her nephew, James Edward Austen, “our Lodgings are very comfortable. We have a neat little Drawing room with a Bow-window overlooking D’ Gabell’s garden”, and even if this is not what people may see from the bow-window nowadays, I like to imagine Jane looking over this window. After this walk, we headed back to the Winchester Cathedral where I met Cassandra Grafton author of A Fair Prospect trilogy and the recently released A Quest for Mr. Darcy. Together we attended to the unveil of the 10£ bank note with the presence of the 120th Governor of the Bank of England, Mark Carney. Mr. Carney demonstrated a true knowledge of Austen’s life and work, making a charming and captivating speech, but he also shared some interesting aspects about the new 10 £ note. For example, on the front of the £10 polymer note there are two clusters of raised dots in the top left hand corner, this tactile feature will help blind and partially sighted people identify the value of the note. I also learned about a few details the new note will have, such as a finely detailed metallic image of Winchester Cathedral positioned over a see-through window, and a book-shaped copper foil patch which contains the letters JA. But the most controversial detail on the note is the quote “ I declare after all there is no enjoyment like reading!”. I have nothing against it, I know it was pronounced by Miss Bingley and that it was said in an ironic tone, but it remains a true statement nonetheless, and I find it appropriate for a note with the picture of a writer. What do you think? I know many people do not agree with this quote on the note, is that your case? The bank note will only enter circulation in September, so I couldn’t come home with one, but thanks to Sophie Andrews, I did come home with a 2 £ coin :)) Do you have it already? The coin was launched in locations that have a close connection to Jane Austen’s life but the design will only be released into wider circulation later this year. The coin is already being sold on Amazon, but the prices are excessive and the coin can be found at reduced prices in any Jane Austen related place, so if you visit places such as the Jane Austen House in Chawton, don’t miss the opportunity to have one of the first coins out there. With this ceremony over it was time to eat something, get some rest and be prepared for the religious ceremony that took most of us there. It was a beautiful ceremony fully dedicated to one of the greatest authors in England and I feel particularly honored to have been there to pay my tribute. The entire day was wonderful with a beautiful weather, but once the ceremony was over, as if crying for Austen, the sky started pouring rain and we had to leave Winchester. 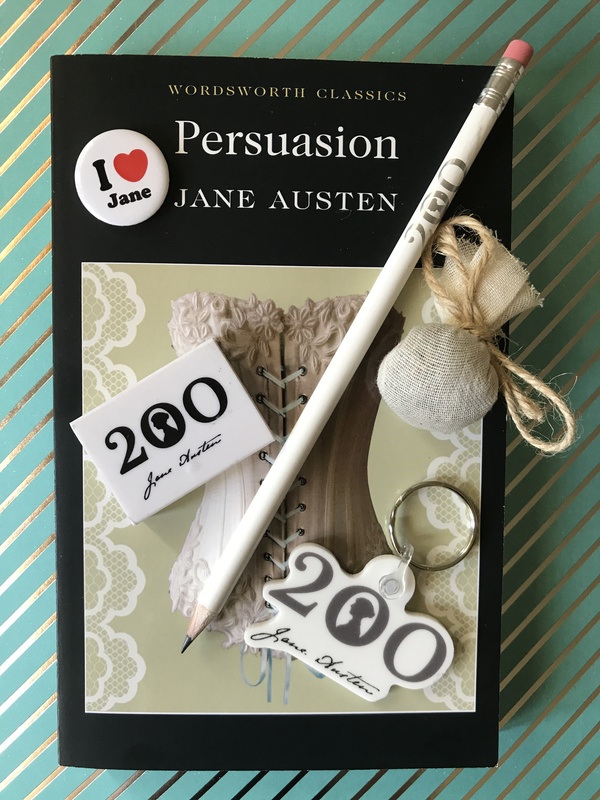 I know that not everybody got a chance to go to Winchester to Jane Austen’s life, so I bring some tokens of the 200th anniversary to offer to one of my readers. As Persuasion was released in 1817, I thought it would be fitting to offer it along with a keyring, rubber and pencil commemorative of the date. I’ve also added an I love Jane pin, and a bag of lavender I made at Jane Austen’s House in Chawton. The giveaway is international, and all you have to do to be eligible for it is to leave your share your thoughts with us by commenting on this post. It will run until the 4th of August and the winner will be announced shortly after. Why is Jane Austen immortal? Today is a very special day for all of us, as 200 years ago Jane Austen left our world. But I believe she remains pretty much alive in the hearts and lives of millions of people throughout the world. There has been a seemingly endless stream of TV adaptations, films, books, and events devoted to our dear Jane, our community continues to talk daily about her in blogs, social media and even ball rooms, and today the city of Winchester received hundreds of Janeites to celebrate the novelists work and her life. There are several ceremonies and events happening today, such as the unveil of the 10 £ bank note with Jane Austen’s portrait, and the anniversary service at Winchester Cathedral. I am very happy and honored to be present in some of them. The bank note is beautiful, isn’t it? And quoting Mr.Darcy at the service was memorable! But what I would like to ask you today is: why do you believe Jane Austen is still so very present in our society 200 years after she passed away? Jane Austen’s writing is not dense or dark, it is funny, ironic, witty, wise and realistic at the same time. Jane Austen wrote about what she knew, she didn’t dwell in themes she was unfamiliar with and that made her writing consistent and precise. The themes she approached are still relevant as she explores the traits of personality that one can still find in our friends, neighbors and even ourselves. Her writing is meant to make readers think about what is surrounding them, but also to give them joy and relief from their rushed daily life, so it is no wonder that in this crazy, busy world readers turn to Jane Austen as an escape from their incessant lives. In her books they find a sense of fulfillment and well being that makes them forget the stress of real life. People who have never read Austen may think she creates love stories with sweet, beautiful women falling in love with dashing heros, but they could not be more wrong. Austen’s heroines are all very different from one another, but they are mainly woman with strong personalities and faithful to their values. They do not bound to men’s wishes as it was expected of them, they fight for their own happiness and beliefs. This is something the current audience continues to appreciate. These smart, strong willed, loyal and witty characters are very easy to relate to, and readers like to see some of their own traits in them. I think I’m a bit of an Elizabeth Bennet in some ways, and maybe a little Marianne Dashwood in others (even if she deeply annoys me… I am clearly team Eleanor). Jane Austen was an observer of human foibles and because of that she created memorable characters such as Elizabeth Bennet, Catherine Morland, Eleanor Dashwood, Fitzwilliam Darcy, Mr. Knightley, Captain Wentworth and Henry Tilney, but also very interesting and funny co-adjuvants who bring humor to the story and add value when it comes to the analysis of human nature such as Mr.Collins in Pride and Prejudice, Miss Bates in Emma, Mrs. Jenkins in Sense and Sensibility. Another interesting fact is that Jane Austen didn’t create perfect characters, they all have their faults and imperfections and that makes them real and believable. They all learn from their mistakes and try to improve and grow as human beings. This is something we all can relate to. The world developed at the speed of light since the 19th century, and our technological advances have been more prominent in the last 50 years than in the 200 years before that. With such development, society itself has evolved and changed. Our values are not the same they were in Jane Austen’s time and I think some people actually would like to go back to the lost values of chivalry, dignity, honor and respect that existed in the 19th century. I know I do! What about you? Why do you think Jane Austen still lives? In Pride & Persistence, after delivering his letter to Elizabeth, Mr. Darcy falls from his horse outside the Hunsford Parsonage and because of his injuries is forced to remain in Mr. Collins living room until he is fully recovered. Having Mr. Darcy close to Elizabeth so soon after the proposal is very appealing to me as a reader, but the plot thickens and becomes even more appealing when we realise that apart from his physical injuries, Mr. Darcy also loses his memory of Elizabeth’s rejection. It is particularly interesting to see that, similarly to the movie 50 First Dates, with Adam Sandler and Drew Barrymore, Mr.Darcy has developed a short-term memory loss that makes him forget everything once he goes to sleep. So every day, when Mr. Darcy wakes up, he doesn’t remember anything that happened after he left Rosings to propose to Elizabeth, and as a consequence, he asks her to marry him every single day. But I also felt pity for Lady Catherine in tyhis book. It is rare for me to feel bad for her, but in Pride and Persistence I did. She is a conniving, manipulative person, but her long lost love story was so tragic that I could understand a little of her bitterness. It’s been a while since I last published something at From Pemberley to Milton and I have to confess I missed my time with you immensely!! Today I’m not bringing you a review, but the names of the winners of the giveaways hosted by Jennifer Joy last month. I would like to ask all winners to send me your contacts and book of choice to ritaluzdeodato at gmail dot com so we can send you your books.